This is the sixth (also last) part of Making Sense of Auto Layout Series. Previously, we have explained what is intrinsic content size and the usefulness of it. In this post we will look into what is constraint priority and how to use them. 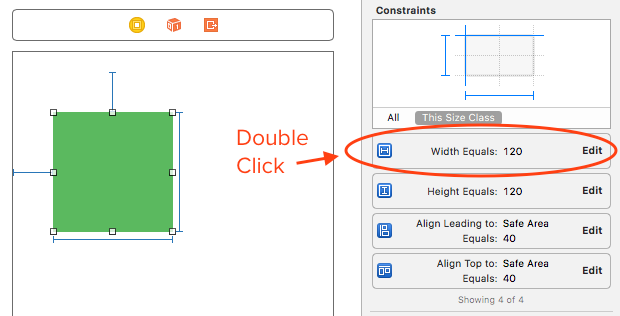 To access constraint priority for an UI element, you can double click into the constraint. You can see there's a field named "Priority", this is the priority of a constraint. Constant priority is a number to determine how important is that constraint. The number can range from 1 to 1000, the higher the number goes, the more important a constraint is. What does important mean? When there are conflicting constraints, Auto Layout Engine will attempt to break / ignore constraint with lower priority number first, hence making constraint with higher priority having higher importance. If there are two conflicting constraints with the same priority number (making it a tie), Xcode will show you red lines with numbers. 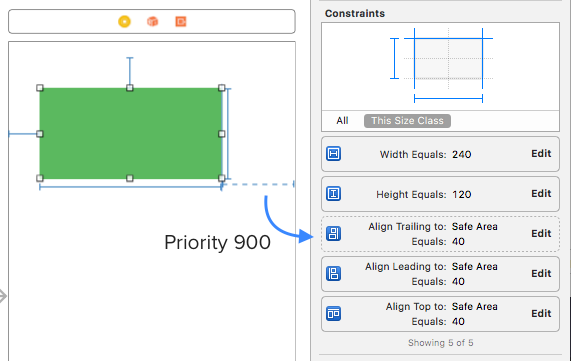 When you define a new constraint in Interface Builder / Storyboard, Xcode will auto assign the constraint priority as 1000. 1000 is the highest constraint priority, meaning it is mandatory as no other constraint can have higher priority than this and this constraint will never be ignored in favor of others. On the other hand, constraints with priority less than 1000 (1-999) are called as optional constraint as it might be ignored in favor of other constraint which have higher constraint priority. Lets use an example similar to the one we used in the chapter why conflicting constraint happen. If you have read the chapter "Why conflicting constraint happen" previously, you know that constraint 1 and 3,4 will be conflicting on another screen size. Using the calculation above, Auto Layout Engine calculated that the width of green view should be 240. Then we also have another constraint explicitly specified the width of green view to 240, since these two values are equal, Xcode doesn't get confused and show blue lines. By calculation, width of green view will be 295, but at the same time there's also another constraint explicitly defined that the width of green view should equal to 240. 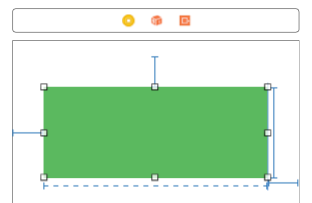 Its impossible to make the green width to be both 295 and 240 at the same time, hence Xcode complains with red lines with numbers. Notice that all the constraints are solid line, meaning they are mandatory and all have the same constraint priority (1000). Previously, we solved this by removing the explicit width constraint, now we can use constraint priority to solve this. Lets set the priority of the explicit width constraint to a lower value, say 900. Since the constraint priority of the explicit width constraint is 900 now, the leading constraint and trailing constraint has higher priority (1000). Thus when there's two possible width value, Auto Layout Engine will pick the one derived from constraints with higher priority, in this case, the leading and trailing constraint. The constraint with lower priority will be ignored by Auto Layout Engine if conflicting situation happens. Similarly, we can keep the explicit width constraint priority to 1000 and instead lower the trailing constraint priority to 900. 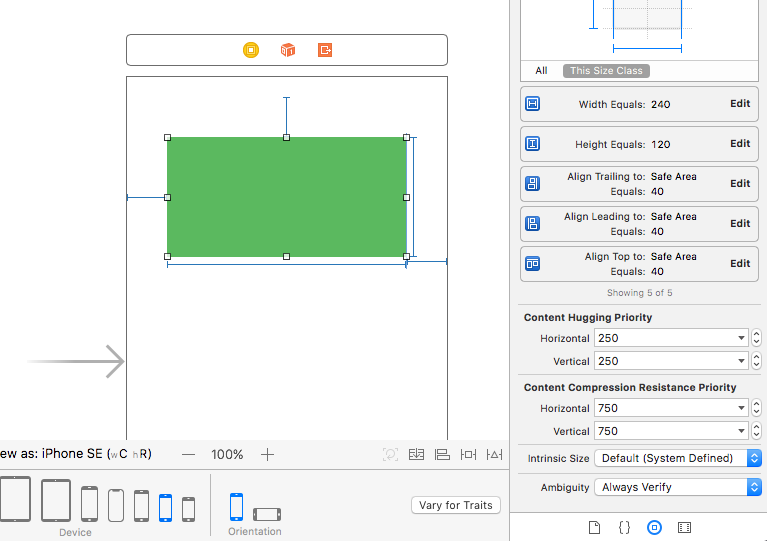 This will make the explicit width constraint priority higher than the trailing constraint, thus Auto Layout Engine will use the explicit width constraint as the width of the green view and ignore the trailing constraint (and also the calculation of width by using leading/trailing constraint). Doing this will make the green view width become 240 for all screen sizes. Constraint priority is useful when you have possible conflicting constraint and you want to tell Xcode which of them can be safely ignored when conflict arise in order to solve conflict. Usually you will want to modify constraint priority of a constraint which uses larger or equal to (>=) / smaller or equal to (<=) instead of plain "equal" (==). 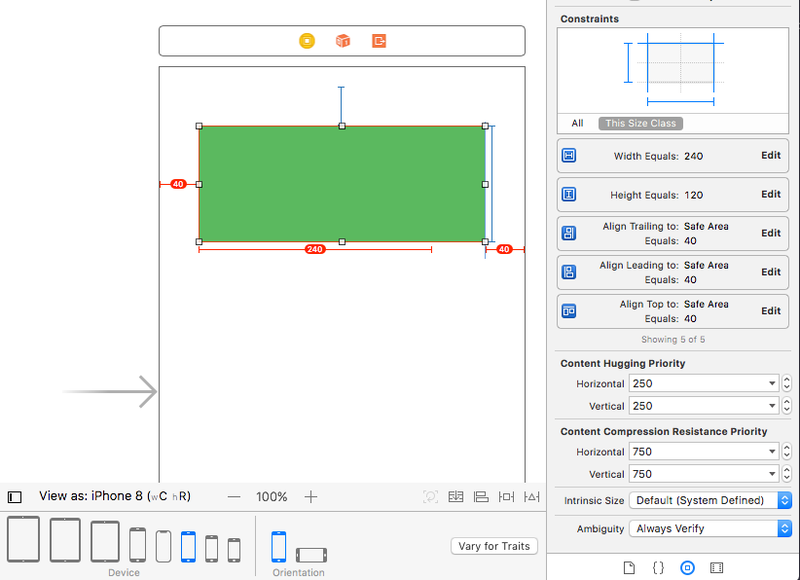 eg: You can set a constraint that specify the view height must be larger or equal to 120 pt. Thanks for taking the time to learn about the fundamentals of Auto Layout. I hope this series has helped you on understanding why layout error happens and how to solve them. If you have any questions, feel free to leave a question in the comments. I have finished writing a book about understanding Auto Layout fundamentals (Constraints, Scroll View, Dynamic height table view cell, Using Stack Views, Animation etc) + Using Auto Layout to replicate popular UI such as Spotify's Now Playing Screen and Twitter's Profile page. I think you would like this book since you have read so far for this Auto Layout Series 😆. I have also made a checklist for troubleshooting auto layout / constraints problem which might be handy to refer at.